How long should it take to clear a failed train off a running line? Great Western Coffee Shop > All across the Great Western territory > The Wider Picture in the United Kingdom > How long should it take to clear a failed train off a running line? Assuming that there was no mechanical reason why this train could not be moved (eg damage to running gear), it is pathetic that Network Rail, as the infrastructure manager, was unable to get this train moved for over 2 hours. It was sitting on the Up Main approaching Paddington in the morning rush hour causing huge disruption. It was within a few miles of its depot. Potential rescue trains (ie another emu or a loco) were available. We’ve had this before, eg there was an HST just outside Paddington a few months ago. It is inevitable that trains sometimes fail, but the railway seems to lack the ability to clear them off the main line within a reasonable time. Whether this is a consequence of modern signalling systems, or a lack of knowledge of how to get a rescue train up to a failed train, or risk-averse managers I don’t know. But NR and the TOCs need to get a plan together to ensure that failed trains are rescued in much less than 2 hours. This morning 464U, 0902 Southampton - Lawley Street, failed between Basingstoke and Bramley. It was there (according to RTT) for 2 hours 56 minutes. This caused a succession of cancellations for long-distance XC's and Basingstoke - Reading locals causing great inconvenience for many passengers. Re: How long should it take to clear a failed train off a running line? A bit of background to this one in that it wasn't the engine that failed but an air leak on one of the wagons. Whether that should immobile a train for so long is a different matter, but it wasn't just a case of finding a replacement loco. Fitters were sent from Southampton and once on site it took less than 30 minutes to effect repairs. The fact a fitter had to come from so far away meant the repair time was around three times what it might have been had there been a fitter stationed at Basingstoke. You can't have fitters at every station of course, though until the turn of the century most large stations had a 'Carriage & Wagon' fitter. That was when there were more traditional freight and passenger trains running around, and many of them didn't exactly have a busy day most of the time. At almost the same time the 10:33 Paddington to Paignton HST came to a stand at Theale with smoke issuing from a power car thereby blocking both routes from Southcote Junction. Fitters were sent from Southampton and once on site it took less than 30 minutes to effect repairs. The fact a fitter had to come from so far away meant the repair time was around three times what it might have been had there been a fitter stationed at Basingstoke. Back when I were a lad, in the days of a joined-up railway, a 50xxx failed on an up fast, between Castle Cary and the switched-out Bruton, quite close to the latter in fact. I received a call from the secondman of the failed loco from the telephone at Bruton box and, after establishing that an air-braked loco was needed, had a chat with the crew of a 47xxx loco that had, rather conveniently, just brought a train of empty stone wagons to berth in the Up Sidings at Witham. I'd arranged with the secondman of the failed loco to call me back in five minutes, which he did, when I was able to set up the rescue, by sending the 47xxx bang road to collect the failed train, all precautions with protection and a reminder about the catch points were properly made. Reminds me of back in the late 1970's. On a Class 50 hauled interregional train from Oxford to Preston held just after Coventry by a failed EMU ahead of us. After about 30 minutes we drew up slowly to the failure, coupled-up and then propelled it to, I think, Birmingham International where we backed off it and carried on our way. We might have been an hour down after all of that, but it made for good sport from a casual observer. There was a Class 52 Western hauled railtour to "celebrate" the end of the Westerns on the Western Region, a decade or more before privatisation. This passed on the line near my home and I fotted it passing on the curve from Westerleigh Junction towards Yate. Just up the line at Charfield the loco hit a cow (the animal type, not the woman type) which had strayed onto the line. This disabled the engine. A model engineer fotting the special from the back railway fence of his property enquired as to what was up, was told, and he ventured onto the line to see for himself and volunteered to effect a repair, went back to his garden shed, switched his metal turning lathe on and turned down a blanking plug he had in stock and returned to the disabled 52 with an adjustable spanner, removed the damaged pipe, fitted an old 10p in the pipe securing it with the blanking plug, the engine regained air pressure and continued with the railtour after a delay of about an hour without further incident. That's the dogey bit but I have heard that story from three sources. Life ain't today, it is almost impossible for a fitter to be dispatched from Reading "Train Care" to a failed freight even in Reading. Back in the unified days of BR a fitter could have been dispatched from Reading Depot in a road vehicle with some common parts. I was on the trip. That makes four sources but I thought it was 1023 "Western Fusilier" at the sharp end. You might be right it's a long time ago and now you mention it I'm not certain I will have a look next time I'm in the attic and can get to the old photo albums. 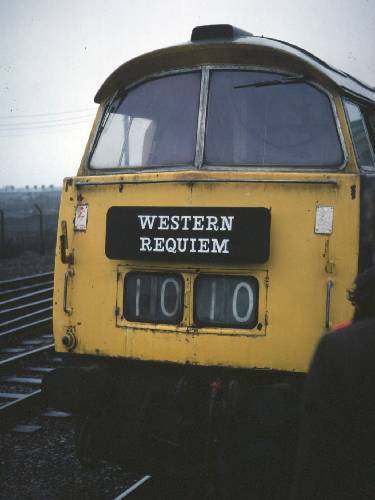 But wasn't the railtour "The Western Finale". That's the one that ran the day before ,the one that I was on from Pad to Bri, and looks like you have it right about it being the tour that hit trouble with cows, I left at Bristol because I'd bunked off school for the day !,and heard later from somewhere that a tour had run into trouble north of Bristol so putting two and two together I must of made five. Makes a change, I am usually the one that puts three and three together to make five but I do confuse my 3 and 5 year old great nieces when I hold my hands up with my fingers and thumbs spread and ask them how many fingers have I got. When they say ten I say, no eleven, closing my left hand, one - two - three - four - five, then my right hand, ten - nine - eight - seven - six, thrusting my right hand forward, six and, thrusting my left hand forward, five makes eleven, confused looks both. The damaged class 52 D1023 "WESTERN FUSILIER"